July 31, 2018 | 4:25 p.m.
Wisconsin isn't the biggest destination for refugee resettlement by far, but the multi-year decline in the state accompanies a similarly dramatic nationwide trend — detailed in data from the U.S. State Department's WRAPSnet system — as the Trump administration increasingly bars the way for displaced and persecuted people hoping to build a new life in the United States. The United Nations, U.S. State Department and international refugee resettlement non-profit groups each play roles in a system to determine if and where a given individual or family of refugees should be resettled. Over the past two years, the Trump administration's policies have set in motion a rapid erosion of the infrastructure that serves refugees when they arrive in the U.S.
One such agency in Wisconsin, Catholic Charities Milwaukee, announced in July that it would end its refugee resettlement program. It's part of a nationwide round of cuts by the United States Conference of Catholic Bishops, a national refugee resettlement agency of which Catholic Charities serves as a local satellite. Catholic Charities' announcement leaves four nonprofits in Wisconsin that handle refugee resettlement work: International Institute of Wisconsin in Milwaukee, Jewish Social Services of Madison, Lutheran Social Services of Wisconsin and Upper Michigan, and World Relief Fox Valley in Appleton. None of those four are currently planning on ending their resettlement program, but each has experienced turbulence since President Donald Trump issued Executive Order 13769 one week after taking office. The order, which became the subject of protests and court challenges, temporarily halted the resettlement process and cut the targeted number of refugees the U.S. would accept in 2017; another executive order issued in October of that year ended the moratorium. Jewish Social Services of Madison, a local satellite of HIAS, has had its current refugee resettlement program up and running for only two years. Resettlement coordinator Becca Schwartz said it's been difficult to put the program on a solid footing over that period. While the local agency is absorbing the effects of diminishing refugee resettlement numbers and associated funding at the national level, it has experienced some busy spells. "We've had an interesting year, mainly because we resettled more people this year than we did last year, which is very, very unusual," Schwartz said. "We're the only agency I've heard of where that's happening." If arrivals are very slow for a while, but then, say, several families arrive for resettlement in a short period, that crunch can put an organization like Jewish Social Services in a bind. 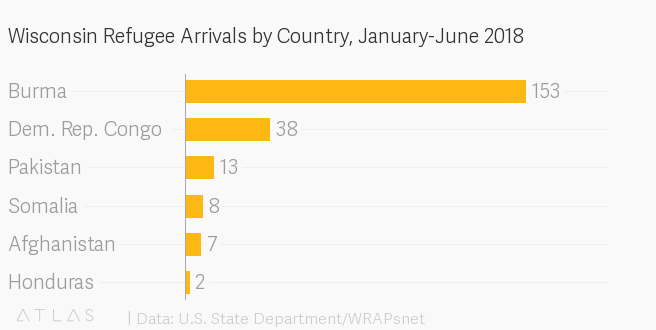 Overall, a steady flow of refugees works better for resettlement agencies. It might sound like a cold budgeting-oriented approach to apply to a humanitarian mission, but if an organization has a reliable estimate of how frequently it will resettle refugees and what kind of funding it will receive, it's much better able plan ahead, determine what kind of capacity it'll have to serve refugees in the future, and where to allocate money and staff. "This is when we would be hiring someone new and at this point — we don't feel like this is a responsible thing to do, because we have a need but we don't know if the work will be there next year or even in a few months," Schwartz said. Refugees resettled in Wisconsin hail from around the globe. 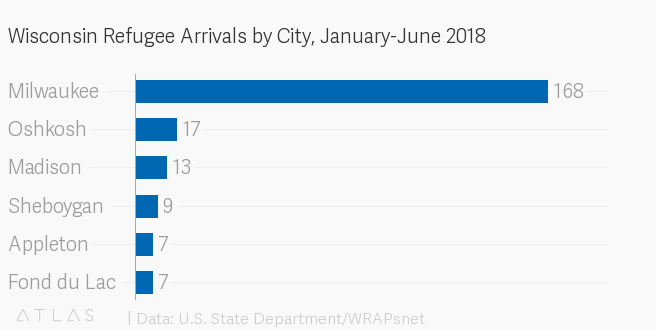 So far in 2018, the biggest country of origin for refugees resettling in the state have been from Burma; people fleeing that nation have been the state's fastest-growing refugee group throughout the 2010s. 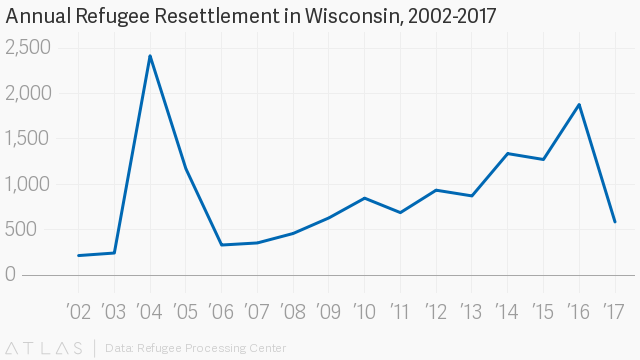 Other refugees resettling in Wisconsin in 2018 have come from Afghanistan, the Democratic Republic of the Congo, Honduras, Pakistan and Somalia. Another trend is that Wisconsin's biggest city, Milwaukee, remains its primary destination for refugee resettlement. Because there are more jobs and support resources to be had in bigger cities, those end up hosting larger numbers of resettled refugees. That said, urban and rural communities across Wisconsin have become home to refugees, and the Fox Cities region has also played a visible role in resettlement. At the international level, refugee resettlement agencies and advocates point to the human cost of limiting options for displaced or persecuted people seeking to escape dangerous circumstances. Even before the Trump administration’s cuts to resettlement goals, the U.N. estimated that only about one percent of the world's refugees were successfully resettled in new countries in 2016. Displaced people can languish in refugee camps for years and years, enduring an insecure and often dangerous life. On Burma's western border with Bangladesh, the nation's Buddhist majority has waged a vicious ethnic-cleansing campaign against a Muslim group called the Rohingya, Hundreds of thousands of displaced Rohingya people have suffered a long-term limbo, because neither country really wants them. Federal refugee resettlement information, including data about Wisconsin, breaks down admissions by nation of origin, but doesn't offer further breakdowns by specific ethnicities or regions from within those countries. This limitation makes it difficult to determine just how many of Wisconsin's Burmese refugees hail from specific groups in that country. However, Rohingya refugees are among those establishing new communities in Milwaukee, and have held protests against the Burmese government. It is in situations like those in Burma when refugees will appeal to the U.N. for help, kicking off what can be as long as a two-year process (if successful) of vetting, including multiple interviews and, if resettled in the U.S., extensive security screening by multiple federal agencies. 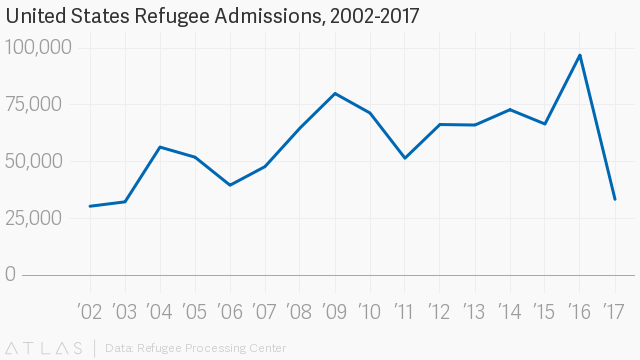 Trump and other opponents of refugee resettlement have called for "extreme vetting" practices, and the U.S. has instituted additional screening measures, contributing to the ongoing drop in admissions.